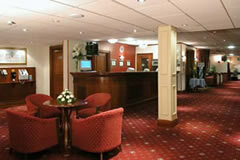 The Hotel is situated within walking distance of Newcastle Airport. If assistance is required getting to the airport, please ask at reception on arrival. This hotel does not offer a transfer service. It is situated next to Newcastle Airport within a short walk to the teminal.If assistance is required getting to the airport please ask at reception on arrival at the hotel. Britannia's Old Rangoon restaurant, serving dishes like Curry, fish and chips and handmade pies. There is also a bar with snack menu. 24 hour room service available and Bar/Lounge menus will be available until 11pm. Where dinner is included it will be a 2 course meal in the restaurant. Children sharing a room with adults must be 15 years or under. Where dinner is included it will be a 2 course meal in the restaurant. Bedroom was dated but clean and the bed was comfortable. However the walls were so thin I heard the guest in the adjoining room use the bathroom 4 times between 11:30 and 4am, Food in the bar leaves a lot to be desired, both in terms of quality and value. Easy checkout and walk to the terminal building. Brilliant service, good value for money. Have used BookFHR.com for a few years now. Really satisfied with the service, meets our needs perfectly. A short walk to terminal. 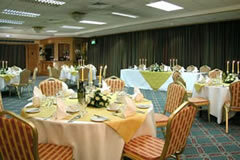 Lovely food, clean room & friendly staff. Would definitely stay here again before an early flight. Dated hotel, needs a complete overhaul. Bar prices extortianate, Â£16 for two vodkas. 5 minute walk to the airport terminal which isn't too bad. Would not stay again. clean and convenient for airport. quiet and restful before early departure. Hotel needs a bit of renovation but staff friendly, food good. Did exactly what we wanted. Would use again. great hotel . great meal. Stayed here a few times either before or after a holiday. Great hotel very conveniently near airport. Rooms ok food great and was a good deal. Hotel rather dated but excellent parking. Used hotel for park, stay and fly, including dinner. Menu was different for this, basically pub grub, but was very nice could not complain about food and service. Rooms were clean, beds comfortable and a good shower. Only negative is public areas are cold, due to people leaving the front doors of the hotel open when they go out for a smoke. I was due to stay at this hotel on my return from holiday, however my flight back to the uk was cancelled so was unable to use the room. I would like to say that the hotel is a few minutes walk from the terminal building & as I booked stay, park & fly deal, my car was left in the hotel car park the full time I was away with no issues. The fact that itâs so close to the terminal is excellent so no transfer needed. 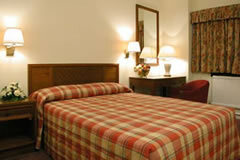 great hotel, great value for money, recommended to all my family. If we have an early flight always stay here, so convenient. 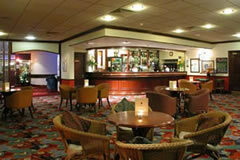 As we landed in the early hours of the morning we stayed overnight in the Britannia Hotel on Newcastle airport. There was a polite gentleman on duty at the desk, and he checked us in quickly and efficiently. Our room was clean and the bed comfortable. The only snag was our inability to get the shower to work. But, we used the bath instead, so our cleanliness was guaranteed. The breakfast next morning was tasty with a good selection of food. We will certainly stay in the Britannia again when we go on holiday next year. Great position, walking distance to the airport. Staff really helpful. Car park was mega full but able to find somewhere. Would go there again. 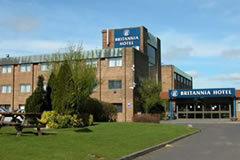 The Hotel is situated off te A696 Ponteland Road.Proceed to the Newcastle Western By-Pass.At the roundabout where the Woolsington By-Pass and Ponteland Road meet with the Newcastle Western By-Pass,take the exit onto the A696 Ponteland road,driving away from Newcastle Upon Tyne. Take the roundabout as though you were entering the airport but exit after the garage (which makes it appear that you are entering the long term car park). However, there is a left turn just after the garage into the hotel car park. What time is breakfast served in morning, can you request it early for an early pickupBreakfast is available Mon 0 Sat 0630 - 09.30 and Sunday 0700 - 1000 and they do have room service. i have two daughters 1 whose seventeen the other 16 can we all stay in one room thats four of usChildren sharing a family room must be 15 years or under so unfortunately you would need to book 2 rooms.